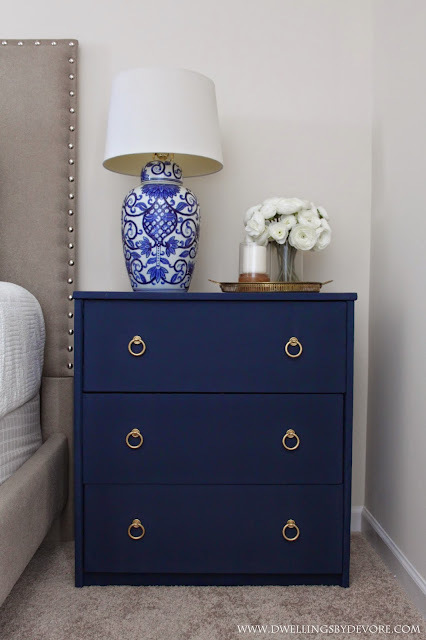 I've been searching for some sort of nightstand for my guest bedroom for the past few months. I haven't come across just the right piece yet, but I did find this little nightstand by the curb a few weeks ago for free. I know it is nothing special, at all, but I had a vision for it and thought for free it was worth a shot. I don't think this will be a long term solution, but for now it's a great fit. It's not solid wood, more like laminate covered particle board, but it works. My plan was to cover the whole thing in fabric. 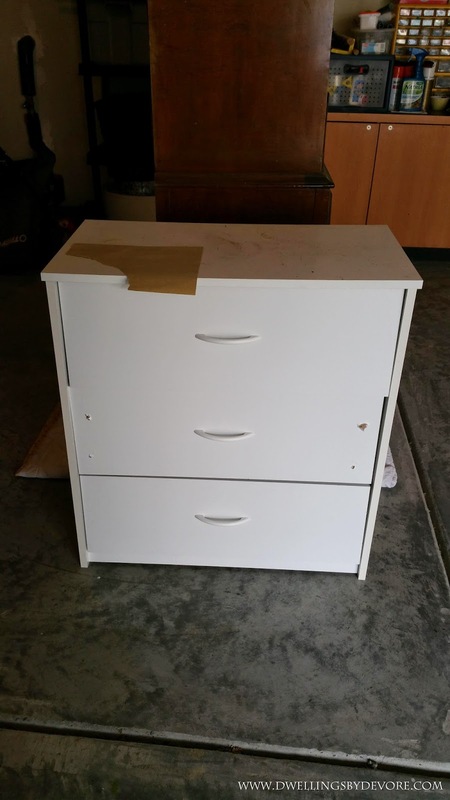 So, I started by taking the drawer fronts off, removing the hardware and sanding down the middle drawer to get rid of the damaged areas. Then I took the rest of the body of the nightstand apart. It was pretty simple to disassemble. I found some navy curtains at Goodwill that were fairly thick and really inexpensive. I cut them into smaller pieces to cover the pieces of the dresser. Then, I used a staple gun to adhere the fabric to the back of the drawer fronts and the back of the other pieces of the dresser. Sorry for the lack of step by step photos, but once I got started I was on a mission and forgot to pause for photos. Basically cover each of the individual pieces with fabric and then put it back together. 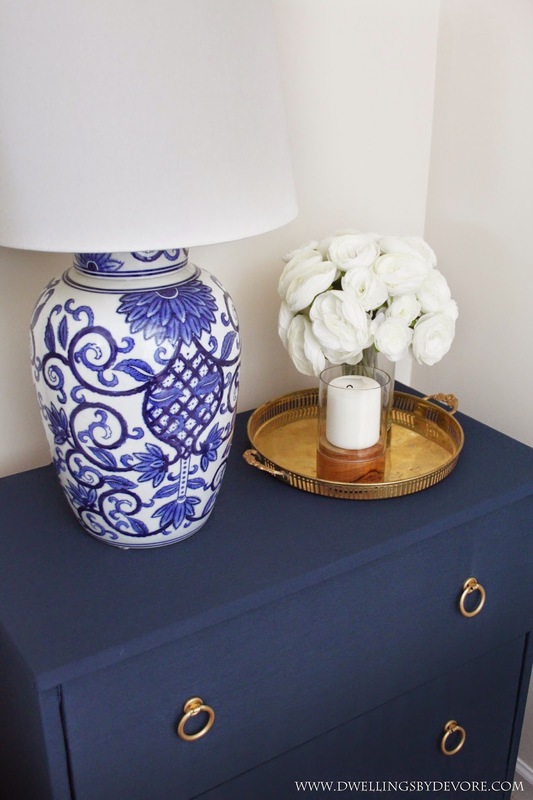 This works best on a piece of furniture that can be disassemble and that has really simple lines. Something like the IKEA Rast would be perfect for this. All in I think I spent around $6. 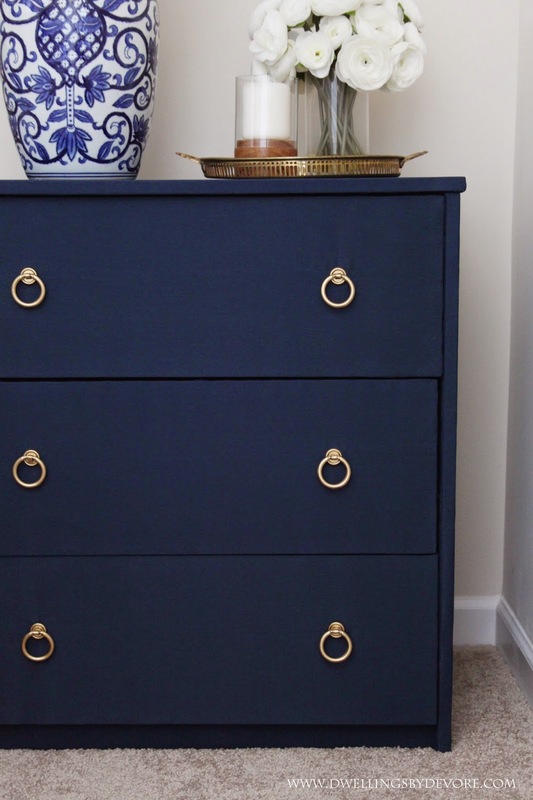 The drawer pulls were leftover from this project so thankfully I didn't have to invest any money in those either. So far it's working great. I think it would be neat to try this with patterned fabric too for something fun and unexpected. If you are worried about spills, you could also spray the whole thing down with scotch guard when you're finished. I'll be sure to update you with how it's holding up!